The region has dramatic variations between summer and winter temperatures; summers are very hot and winters very cold. For example, Sioux Falls averages 25 days each year with temperatures above 90 °F (32 °C) and 45 days each year with temperatures below 5 °F (−15 °C). Mitchell, South Dakota has a record high of 116 °F (47 °C) and a record low of −39 °F (−39 °C). 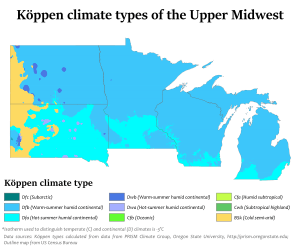 The Inland North dialect, most prominently characterized by the Northern Cities Vowel Shift, is centered in the eastern part of the Upper Midwest, including Wisconsin, Michigan, and the northern parts of Illinois and Ohio; it extends beyond the Midwest into Upstate New York. North Central American English (also known as "Upper Midwestern"), a residual accent of American English, is spoken in Minnesota, parts of Wisconsin and Iowa, the Upper Peninsula of Michigan, portions of Montana, and the Dakotas. The Upper Midwest was the heartland of early 20th-century Progressive Party politics, and the region continues to be favorable to the Democratic Party of the United States and moderate Republicans, with Minnesota favoring each Democratic presidential candidate since 1976 and Wisconsin from 1988 to 2012. Minnesota narrowly supported native Walter Mondale in 1984 in an election where Ronald Reagan won every other state. Michigan, Illinois, and Wisconsin also often favor Democratic candidates. By contrast, the lower Midwest includes swing states such as Ohio, Iowa and solidly Republican (until 2008) Indiana. Missouri has voted reliably for the Republican presidential candidates in recent elections. The Plains States/The Dakotas to the west are heavily Republican and have voted Republican in every presidential contest since 1964. ↑ Allen, Harold B. (1973). The Linguistic Atlas of the Upper Midwest. Minneapolis: University of Minnesota Press. ISBN 0-8166-0686-2. ↑ Labov, William; Sharon Ash; Charles Boberg (2006). The Atlas of North American English. Berlin: Mouton de Gruyter. ISBN 3-11-016746-8.